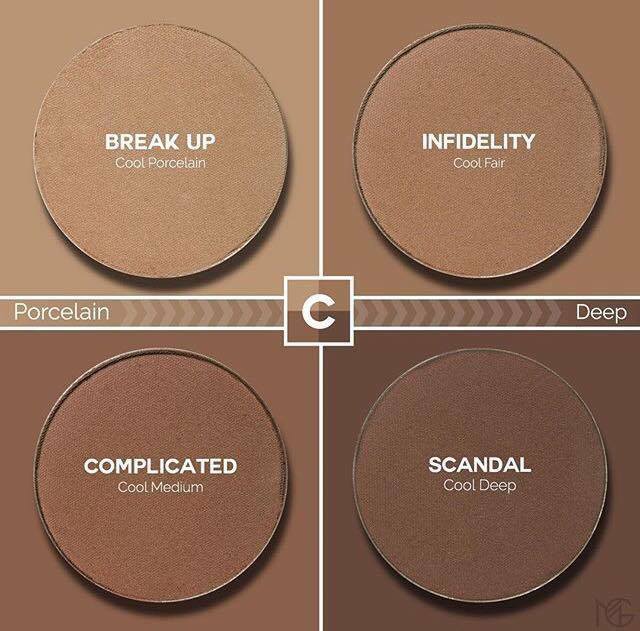 I don't know if you have heard but Makeup Geek have released their new powder contours. This is exciting mostly because their powder products, like their beautiful eyeshadows and blushes, are known to be hits in the cosmetics industry, Marlena does a wonderful job with all of her products. She really does think of everything and these eight new contour pans seem to be no different. They retail for $10 each or you can get all 8 for $65 if you are a makeup artist or just want the whole range. To buy click HERE. You can see from them all swatched above that the eight colours fortunately span all skin tones from porcelain to deep. 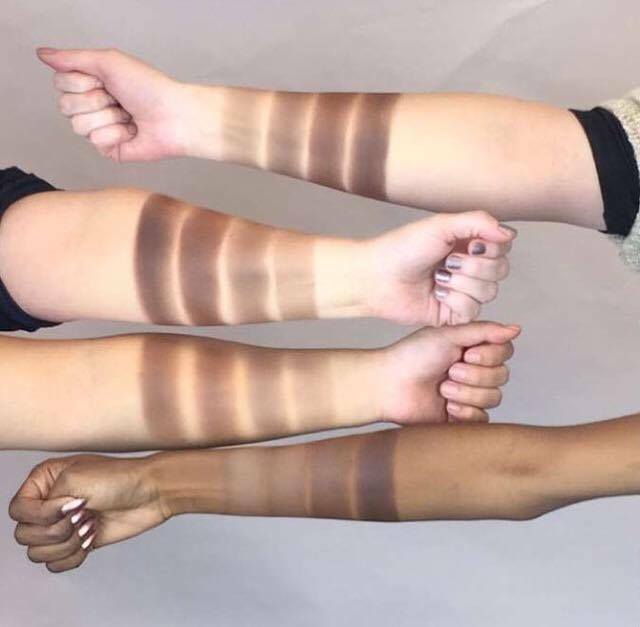 The way it works is that there is a cool and warm contour shade for each of the four skin tones: porcelain, fair, medium and deep. Starting with the cool contour powders, lightest to darkest: Break Up for porcelain skin, Infidelity for fair skin, Complicated for medium skin and Scandal for deep skin. Then there are also the warmer contour pans which from the lightest to darkest are: Love Triangle for porcelain skin, Bad Habit for fair skin, Half Hearted for medium skin and Deal Breaker for deep skin. 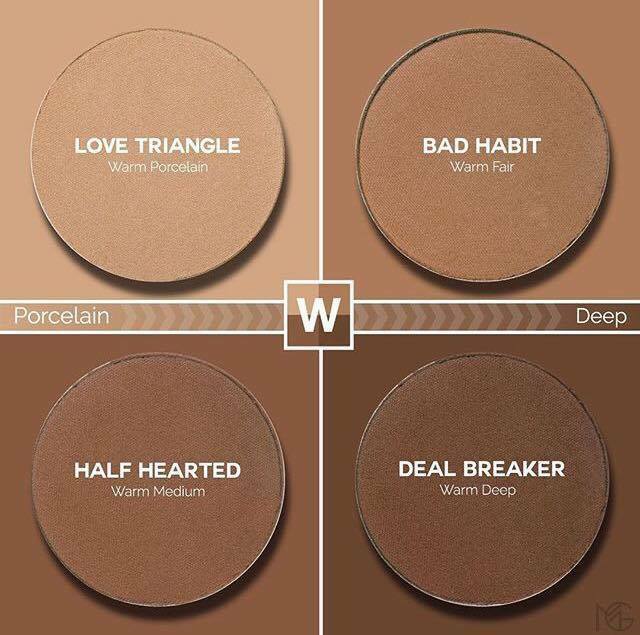 Personally, I love the warmer contour shades for my medium skin, although I could see that it would make sense to purchase both the cool and warm contour shade in your skin colour as a true contour is quite a cool shade and then you could add the warmer counter part to blend it out and add warmth. To see what each pan individually looks like on the skin, see below. 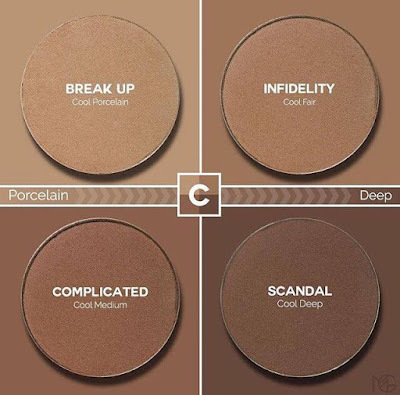 These are the Porcelain and Fair shades, in both the cool shades on the left (Break Up and Infidelity) and the warm shades on the right (Love Triangle and Bad Habit). In these pictures they are used individually, I think typically the fairer you are the better cool tones look on you. In contrast, I think deeper skin tones from medium to darker skin suit a warmer palette, but that is just my personal opinion. Below, we have the Medium and Deep contour shades demonstrated singularly on these gorgeous models with the cool contour colours (Complicated and Scandal on the left) and the warm pans (Half Hearted and Deal Breaker) shown on the right. Based on these pictures, I would say Half Hearted would be my shade but I would be tempted to purchase Deal Breaker and Complicated too. As sometimes a girl just wants a stronger contour, right? Let me know, in the comments, what shades you would get and your thoughts on these new contour pans, will you be buying? Thank you for reading, I hope you're having a lovely week. Please don't forget to follow and comment, it really means a lot and I read and reply to them all. Take care. A pleasure, Leanne! Thank you for your comment, I need to get my hands on some of their eyeshadows. I know Marlena is working on concealer too, so exciting, because you know she always comes through!